I don't know if this is the right place or not for this kind of stuff but I wanted to say in a public forum kudos to the guys at A&A, in particular Craig. From what I've seen, not only is their work top notch but their customer service and ability to work with people has always been excellent. Even when overworked, sick, or injured (or all of the above at some point this year!) they are always very pleasant and never give you the sense of being rushed. They must have incredible patience listening to what a less educated person (such as myself) is looking for and describing at times in relative laymans terms. Good work guys! Add yet another person from this forum who would highly recommend A&A to anyone, and I look forward to seeing the next custom project you'll be doing for me. I'll second that. Arms and Armor's commitment to their customers and their products is unreal. I know that a word like "honor" has no place in today's business world, where it's all cut-throat politics and get ahead at any cost ambition, but A&A brings that word back from the dead, not only in the way they make their products but in the way they stand behind them. Kudos to A&A and Craig Johnson indeed. I agree that A&A is a good and honorable company. They won't let a product out of their door until they have put their best into it. 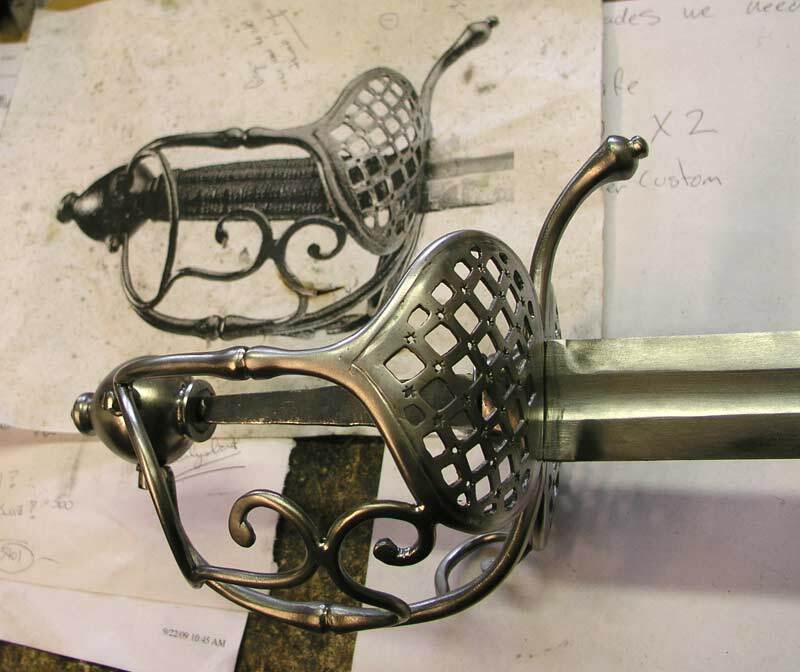 During the process of making my custom sword, they were responsive to my requests for progress reports, sent me photos when they were available,and put extra effort into producing a wonderful recreation down to tha last detail. I've dealt with A&A for years and have always found Craig and Co. to be a first-rate class act. I'm particularly intrigued by their custom work, the more I see of it the more impressed I become. I may have to go that route with them some day. As the owner of 4 standard production pieces and one custom axe from them I have to say that I am not done with them. Either from their standard catalog of polearms and daggers or the custom route. I'm just saying is all. Roger, though your sword is later then my area of interest I really like it. I might just have to get something similar one day. I would also like to thank Craig and cohorts for their great service over the years. And while I have only ever ordered 1 custom piece (a shortened German branch sword, for my wife), I have always been pleased to do business with them. I especially wish to thank their workers at the Bristol Renaissance Faire for all the help and great service over the years - it makes taking the 6+ hour trip that much more memorable! Thank you all SOOOO much, and have a great holiday season! I know that I am very much looking forward to a custom order I placed. I'll keep it a surprise until it is done (we haven't started it yet). It is very exciting, but when the time comes, it will be an incredible statement piece. Thank you for such kind words and great support. A&A is a very hard working group of people who deserve all the credit for what we do. Chris the owner and Mark, Ian, Greg, Tom and Josh, the crew who make it all happen. We strive to make each customer feel like they get a little extra with each order. Sometimes we fall short but we always strive to make it right. The support people have shown us over the years is the most gratifying part of doing our job. Sometimes things don't work out as expected when ordering custom swords and even A&A might have the odd piece leave their shop that isn't 100% to the customers satisfaction. But the way they handle these rare complaints sets them apart from most companies. A&A is a good example of how a business should be run. Kudos to them. I have never been a customer of A and A although get to scabbard their wares from time to time so I am familiar with a number of their swords, which appear to be fantastic value for money as far as I can see, but it means I can't comment about their customer service. However I can comment in general as a maker and supplier of period arms. We all make mistakes, that is is part of being human and has nothing to do with customer service; it is what happens next that is important and unfortunately it appears that A and A were not given the opportunity to rectify a problem and so make up for a mistake. Obviously not seeing what the problem was makes it hard, but it does not suprise me at all that the odd not so good piece comes out of A and A just like the odd not so good piece comes out of every other manufacturers or craftsmans shop on the planet - people cannot get it right every single time. I suspect in the case of A and A this is a very rare occurrance. Like I say, it is how a customers complaint or grievance is dealt with that reflects the true nature of the company and judging by peoples' comments regarding customer services at A and A, I can only surmise they would have been mortified by a complaint of the nature made by Rusty and moved hell and high water to rectify it and return him to 'happy customer status'. I suspect a opportunity was lost by A and A to learn from a mistake and Rusty to have his sword reworked to a quality he was happy with. As a general not to all buyers out there; if you aren't happy with it let the maker know. Custom work is custom work and both the builder and the customer are engaged in a venture fraught with risk, things simply don't work out perfectly all the time. Once in a while something falls through the cracks. Making corrections is part of the process and denying a producer an opportunity to correct a problem is, to my mind, short sighted and fundamentally unfair. people cannot get it right every single time. When you have people working with their hands, it's not possible to make things perfect every time. You're going to have the occasional problem, and I have had such problems with all of the major makers. What sets the great ones apart from everyone else is what they do about these problems. The degree to which Arms and Armor stands behind their products is exemplary. People can buy from A&A with complete confidence, and that's no small thing these days.